Submissions are being accepted for the annual Freshman Writing Award competition. This competition is designed to encourage and recognize excellence in student writing and to help foster a culture of writing at Webster University. Submission Deadline: Friday, Feb. 10, 2017, at 5 p.m. Faculty is encouraged to consider nominating one or more student's papers for this award. Students may also request that an instructor nominate their work for the award. 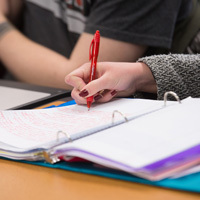 Nominating faculty members should complete and return the Freshman Writing Award Submission Form to the Writing Center or email it to websterwritingcenter@gmail.com. Awards will be given out in April at a ceremony and luncheon. Click here for more information about the competition, or call Dr. Carolyn I. Brown, Writing Center and Plagiarism Prevention Coordinator, at (314) 246-7668, or email at carolynbrown04@webster.edu.